Built Dakota tough and crafted out of Lithium Iron Phosphate (LiFePo4) technology this is a battery built to last. With a lifespan of 2,000 charge cycles this battery will last up to 5 times longer than your typical SLA battery while providing 75% more capacity at 60% less weight. Rated at 7 amps, this is our smallest and lightest battery. 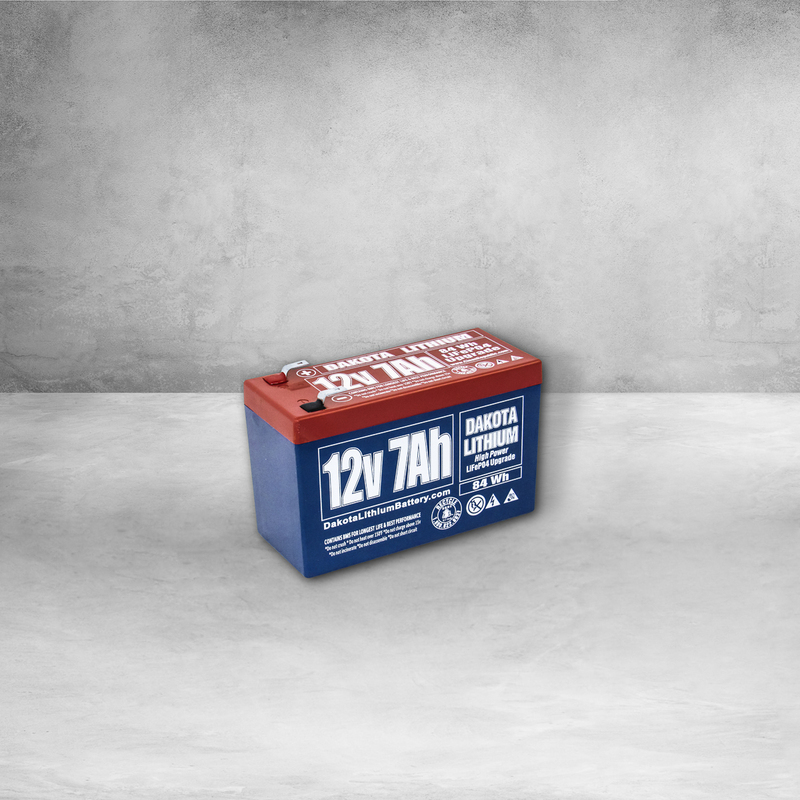 Ideal for industrial purposes where you need a long lifespan battery that charges quickly, or for outdoor uses where weight is at a premium. Bulk pricing available for quantities of 2 or more. LiFePO4 charger recommended for optimal performance. 5.94"x 2.55"x 3.74" (151x65x95mm). Replaces UB1280 battery and many others. 2lbs 2oz (1.30Kg). That's 60% lighter then a SLA battery. 7 ampere hours. 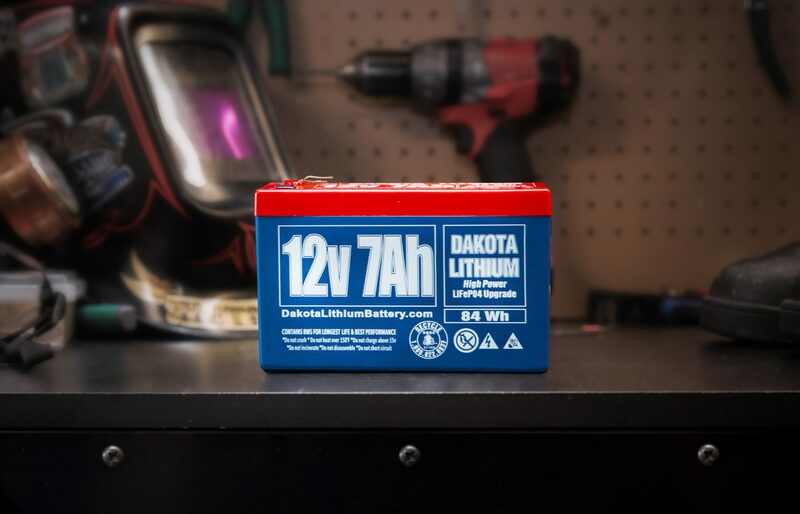 Dakota Lithium batteries provide consistent power for all 7 amp hours. DL LiFePO4 batteries have a flat voltage curve, which means they have a steady power output as the battery discharges. The power output will not dramatically drop like similar sized SLA batteries. You get all the juice down to the last drop. Up to 80% capacity for 2,000 cycles in recommended conditions. The typical SLA has 400 cycles. Dakota Lithium batteries last so long that the price per use is a fraction of traditional batteries. 20 A max continuous, 50 A max 300 mS pulse. 9.0 V max discharge, 11.0 V max recommended discharge. For longest lifetime recommended discharge rate 1-5 Amps. The flat discharge voltage curve provides a 75% bigger capacity then a SLA 10Ah battery. 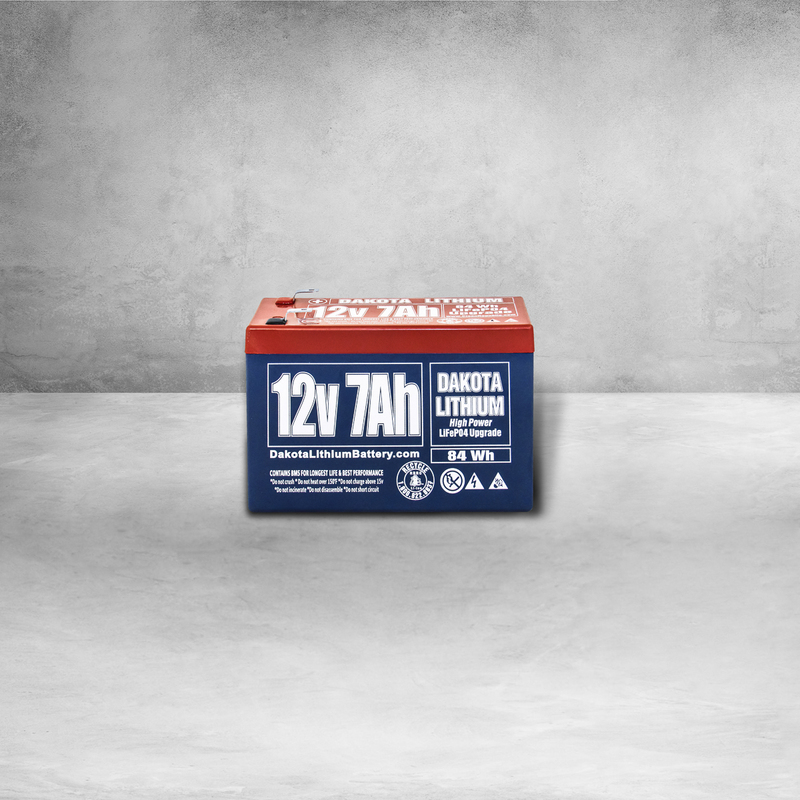 10 A max, 14 V max recommended, 15 V max. Please note: this battery should be charged using a LiFePO4 compatible charger. A SLA charger may work, but will reduce performance and lifespan of the battery. Contains a circuit that handles cell balancing, low voltage cutoff, high voltage cutoff, short circuit protection and temperature protection for increased performance and longer life. This battery should be charged using a LiFePO4 compatible charger. A SLA charger may work, but will reduce performance and lifespan of the battery. Great power, small form factor and size. The power to weight is wonderful. Thank you!!! Very light; not clunky like the PbCd. Very happy with this battery, it’s very light, holds charge forever and doesn’t drop voltage nearly as fast as SLA. A very lightweight battery. Performed exactly as described, works great and a good replacement for my old lead battery, very fast shipping. Thanks! Nice batteries, just as described and quick shipping! Thanks! Great service!!!! I’ll be BACK!!!! Super good battery and it works great for my ham radio. I got the lithium charger since my old SLA charger doesn’t work with these. Easy transaction – Thanks! Astoundingly light battery.